Topics: Projects, Recruitment, Commercial & Retail, Education, Healthcare, and Hotel & Leisure. 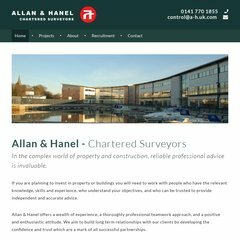 a-h.uk.com Allan and Hanel Chartered Surveyors - Quality Professional .. It is written for ASP.NET language. It has 3 DNS records, ns0.demon.co.uk, ns1.demon.co.uk, and ns2.demon.net. Serverbeach (New York, New York) is the location of the Microsoft-IIS/6 server. PING www. (64.34.193.13) 56(84) bytes of data.